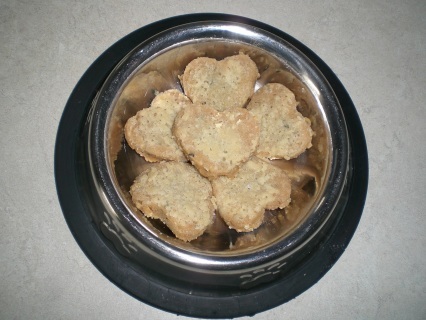 Most dog food and treats are made with wheat which is not good for them. I use rye flour when making dog biscuits and have teamed up with Pam who has a gluten sensitivity and noticed her animals do too. We are now making both rye and gluten free treats with coconut oil as well! Why coconut oil? it gently elevates metabolism, provides a higher level of energy and vitality, protects from illness, speeds healing, improves skin and coat, improves digestion and reduces allergic reactions according to alternative health practitioners. Top 10 Dog Toxins in 2013 1. Chocolate Chocolate contains theobromine and caffeine, which are both classified as methylxanthines. These compounds can cause hyperactivity, increased heart rate, tremors, and potentially death. The more bitter the chocolate, the more toxic it is. Bakers and dark chocolate are the most toxic, and milk chocolate can be dangerous if ingested in large amounts. 2. Xylitol Xylitol, a sugar substitute common in sugar-free chewing gum and many other products, can cause life-threatening hypoglycemia and liver damage in dogs. 3. NSAIDs Non-steroidal anti-inflammatory drugs like Advil, Motrin and Aleve, can cause GI ulcers and kidney failure. 4. Over-the-counter cough, cold and allergy medications Many of these preparations contain acetaminophen (a painkiller) and pseudoephedrine or phenylephrine (decongestants) and are highly toxic. 5. Rodenticides Rat and mouse poison can contain inactive ingredients that are attractive to dogs. Aside from eating the poison itself, dogs can also become sick from eating a rodent that has ingested poison. Exposure to rat and mouse poison can cause bleeding, seizures and kidney damage. 6. Grapes and raisins These foods, even in small amounts, can cause kidney failure in dogs. 7. Insect bait stations The danger here is primarily bowel obstruction when a dog swallows the plastic shell that contains the bait. 8. Prescription ADD/ADHD drugs These drugs are amphetamines that can cause tremors, heart problems, seizures and death in pets. 9. Glucosamine joint supplements These supplements are often flavored to appeal to dogs. Overdoses usually produce nothing more dangerous than diarrhea, but in rare cases, liver failure can result. 10. Oxygen absorbers and silica gel packs Oxygen absorbers are found in packages of pet treats, beef jerky, and other consumables, and they contain iron that can cause iron poisoning in dogs. Silica gel packs are the small white packs found in new shoes, purses and backpacks. Top 10 Cat Toxins in 2013 1. Lilies The variety of lily determines whether it is relatively harmless or potentially deadly. Non-toxic varieties include the Calla, Peace and Peruvian, and typically cause irritation of the upper GI tract. Toxic lilies — including the Tiger, Asiatic, Stargazer, Casablanca, Rubrum, Day, Japanese Show and Easter lily — can prove deadly for your cat. Just a tiny amount of any portion of these plants can cause kidney failure. 2. Household cleaners General-purpose cleaners are relatively safe (all-natural products are a much better choice), but concentrated products like drain or toilet bowl cleaners can cause chemical burns. 3. Flea/tick spot-on products for dogs Never use a canine flea/tick product on your cat. Depending on the ingredients in the product, just a drop has the potential to kill a cat within hours. 4. Antidepressants Cymbalta and Effexor topped Pet Poison Helpline’s toxic antidepressants list in 2013. For some reason kitties are drawn to these medications, which can cause severe neurologic and cardiac effects. 5. NSAIDs Cats are more sensitive than dogs to non-steroidal anti-inflammatory drugs like ibuprofen and naproxen. And because kitties are so sensitive, veterinary-specific NSAIDs should be used with extreme caution, if at all. 6. Prescription ADD/ADHD medications Just as with dogs, these drugs, which are amphetamines, can cause tremors, heart problems, seizures and death in cats. 7. Over-the-counter cough, cold and allergy medications Many of these preparations contain acetaminophen (a painkiller) and pseudoephedrine or phenylephrine (decongestants). Acetaminophen is especially toxic to cats – it damages red blood cells and causes liver failure. 8. Plants containing insoluble calcium oxalate crystals Peace lilies, philodendron and pothos can cause oral and upper GI irritation, foaming at the mouth and inflammation when ingested. 9. Household insecticides If you use insecticides on your indoor plants (which I definitely do not recommend, since they are environmental toxins), make sure to keep your kitty away from plants after application until the products have dried or settled. 10. Glow sticks and glow jewelry Many cats enjoying gnawing on glow sticks and glow jewelry. These tems contain dibutyl phthalate, a chemical that can leak out and burn your cat’s fur and tongue.